When you see the transmit warning status indicator it indicates that your WatchMate Vision is not transmitting your vessel position and other information. Touch the warning symbol to determine why transmission is disabled. 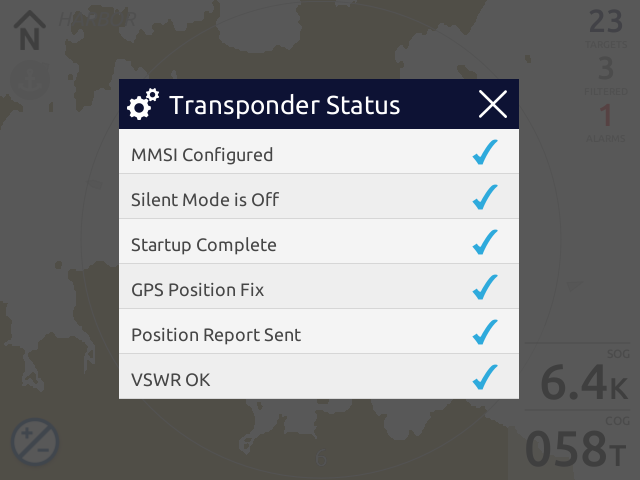 The AIS Transponder Settings screen has controls to disable transmission manually by selecting silent mode. It also allows you to set or review your vessel details. By touching the status or advanced icons you will receive further information. A valid MMSI must be configured. Your MMSI may have been entered already by your dealer. If you do not have an assigned MMSI, contact the relevant authority in your country. Do not enter a false or unassigned MMSI number. Once you save the MMSI number you cannot change it. If you need to change the MMSI, please contact an authorized dealer or Vesper Marine. Silent mode must be switched off. When silent mode is on your WatchMate Vision will continue to receive both GPS and AIS and will operate normally. However, transmissions will be disabled. There is a one minute startup period while your WatchMate Vision assesses the background signal levels and prepares itself for transmission. You must have a valid GPS fix at all times for transmission to occur. It is very important that you have a good and stable fix since you will be automatically transmitting your position, course and speed to other vessels. If you are unable to acquire and hold a stable GPS fix using the internal patch antenna, you must attach a Vesper Marine external GPS antenna. When all requirements are met, your WatchMate Vision will begin transmissions. It transmits your position, course and speed every 30 seconds when your vessel is moving faster than 2 knots. When you are moving slower than 2 knots these transmissions will occur once every 3 minutes. Regardless of speed, every 6 minutes your vessel name, size, call sign, size and other details are transmitted. It is normal in very heavy traffic areas to occasionally miss a transmission due to congestion. When this happens the Position Report Sent warning indicator will come on until the next scheduled transmission. Finally, your VHF antenna system is a critical component in achieving the best performance from your WatchMate Vision. All cables must be in good condition and connections must be well made, tight and secure. The antenna must have low VSWR at the 162 MHz AIS frequency.